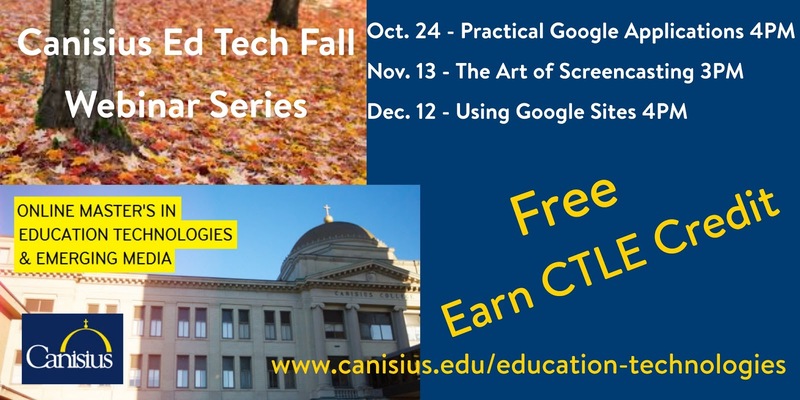 The Canisius College Education Technologies Program is hosting a third FREEwebinar on practical applications of technology in the classroom. During this last session participants will have the opportunity to ask questions about the technologies modeled. Participants will also earn CTLE credits! Our third session will be held on December 12, at 4:00 pm. Ron Kotlik, Canisius Ed Tech Director, will host a session on using Google Sites to create teacher and student website projects. This session explores how to create websites using Google Sites. This is an introductory session that helps educators learn how to use this tool with their colleagues and students. Participants will guided on how to create and name a Site, navigate the menu options, share a Site, design a Site, use templates, and publish a Site. Classroom project ideas will be modeled. Please use this link to register for the webinar. If you cannot make this session, consider taking a course this spring in our online Ed Tech Program. Classes provide teachers with innovative and practical tools that can immediately transform their classrooms. Each 3 credit hour course is equivalent to 45 CTLE hours!